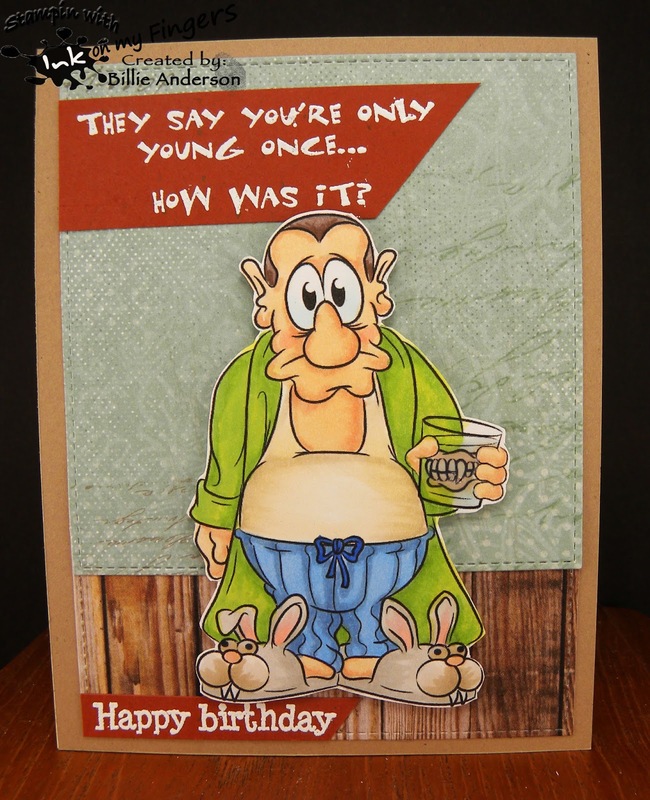 I was thinking I need a masculine birthday card. now I am no sure if I pulled it off or not.. I guess it depends on the guy.. 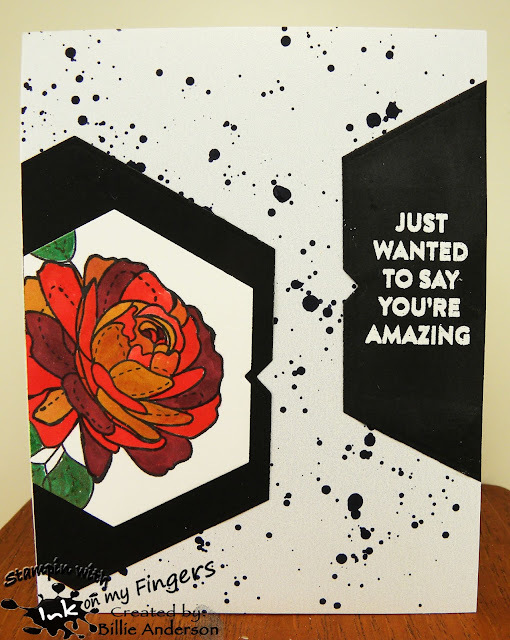 I used My favorite things flowers and stamped them with Altnew inks. I then added the Paper trey ink sentiment on a scrap piece of Quick Quote paper and added sequins. Hello.. I am in desperate need of Thank you cards. So I am going to be posting them over the next few weeks or so.. Not sure cause don't know how many I will end up making. 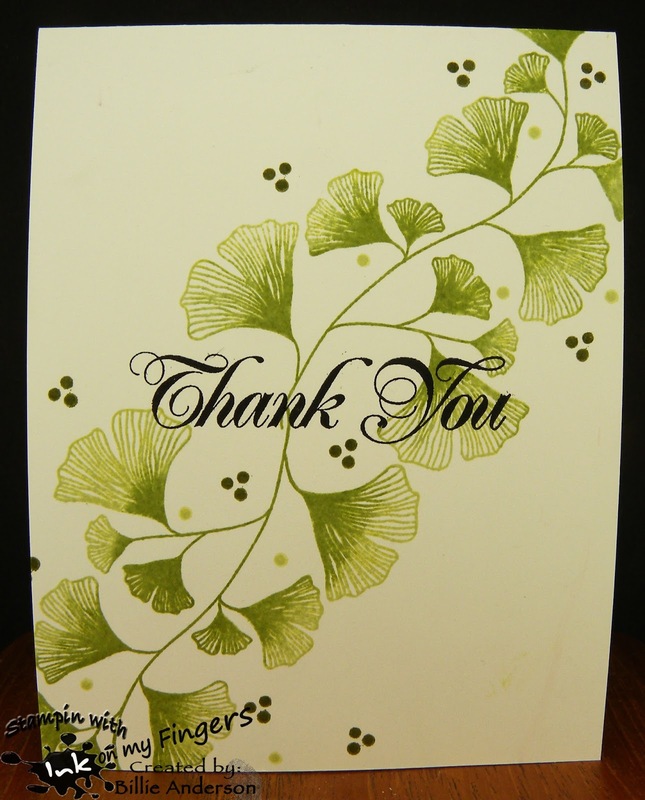 For this card I used Paper trey ink ginkgo leaves stamped them twice and added some dots. I added the Thank you which I don't know who it's by.. The inks are Ranger. I like this being a fast card and pretty simple. Today at Catch the bug.. we have a theme..
See the photo below and go for it..
Quite some time ago I went through my scraps and took my paper shredder and ran the scraps through it.. (I need to do that again as that pile is quite high).. so I dug through it to find colors that would work for the photo. I laid them down and then cut off the extended pieces. I love the look and get a small dent in my box of strips. I then colored the image Ladybug daisy vase from Bugaboo with copics. I used a Club scrap happy birthday and embossed with Stampin up black. I added some Nuvo drops. Love the spring feel of this card. Can you believe it's almost the end of Apri?? wow. Summer is coming.. I am such a hot weather person so this will be great. 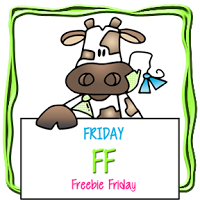 Hello again.. welcome to Bugaboo's Free Friday.. Check out the fun creations over at Catch the bug. This is the Free Friday called Bug rose can I circle cut the image before I even thought what to do so before I colored the image I looked through some designer papers. I have so many because I use to buy buy buy papers.. I have an issue with need this for new paper.. well I have more paper than I can count. I have NOT gone out to buy anymore BUT I do belong to Simon Says kit of the month and there is always a 6x6 selections of awesome papers.. I think this is where the yellow and dotted gray came from?? I love the yellow script is saying hello sunshine.. so I ended up coloring the image with copics and did yellow flowers I used Spectrum Noir sparkle pen on the flowers and heart on the can. 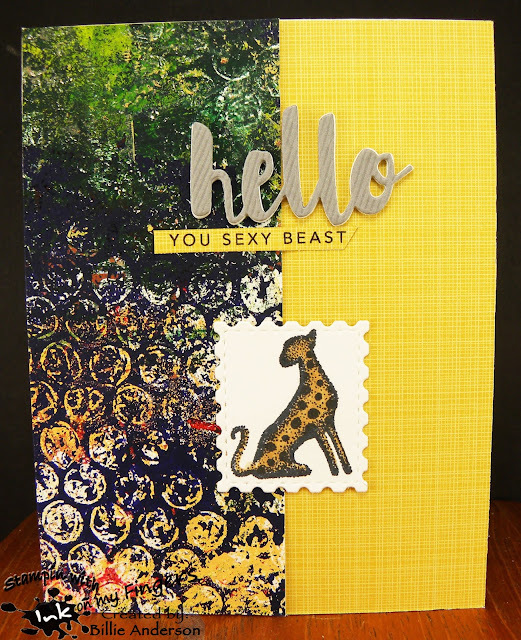 So then I took the gray piece and Simon Says scallop die and cut the piece and added this to the yellow. I added the circle on foam. I then used SS hello die and sentiment which is embossed. This is so much fun. I completed the card with some Close to my heart dots. 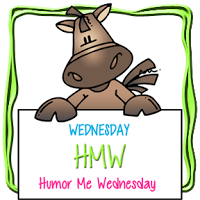 I am using the fun image called Drac's dentures.. I love the fun images from Dr. Digi's and this one really made me laugh when I made it. I had three sentiments I wanted to use. I asked my hubby for his choices and he was really stumped also as they were all good. But this is the one he decided would be best. I agree but boy there was a close second one. 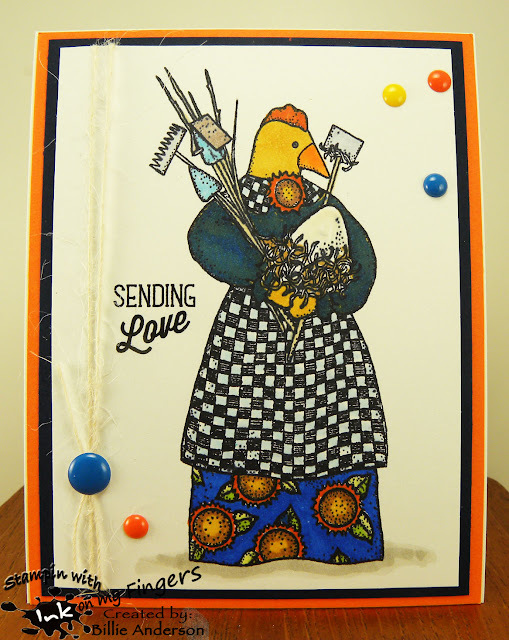 I used some scraps and used My Favorite Things stitch die. I colored the image with copics and added glossy accents to the glass of dentures and bunny eyes. I heat embossed the sentiments. The top one is from Art Impressions. The happy birthday I don't know who it's by. I hope I have inspired you to play along. 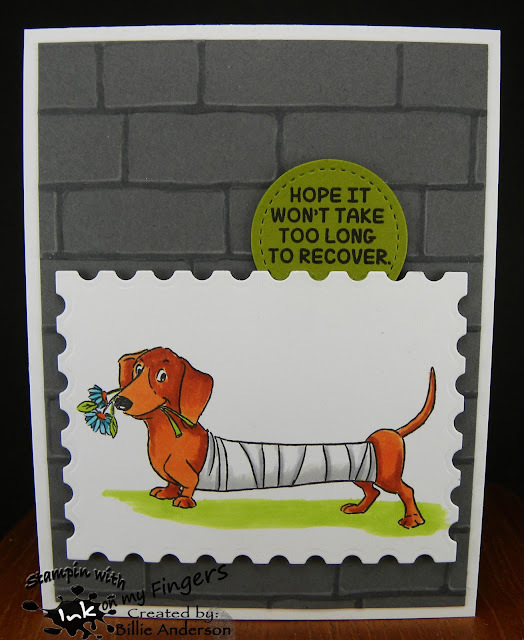 I decided to make a get well card. I can always use them so now I am making one. I started with Stampin up gray card stock and embossing folder. I used a dark C5 copic to add the mortar between the bricks. I then used a My favorite things postage die and Art Impressions stamp and colored with copics. 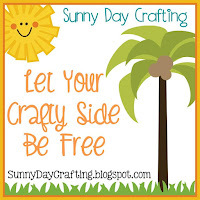 I stamped the sentiment and die cut the stitch circle which is by Stampin up. This is such a fun card and know who ever gets it will make them feel better. 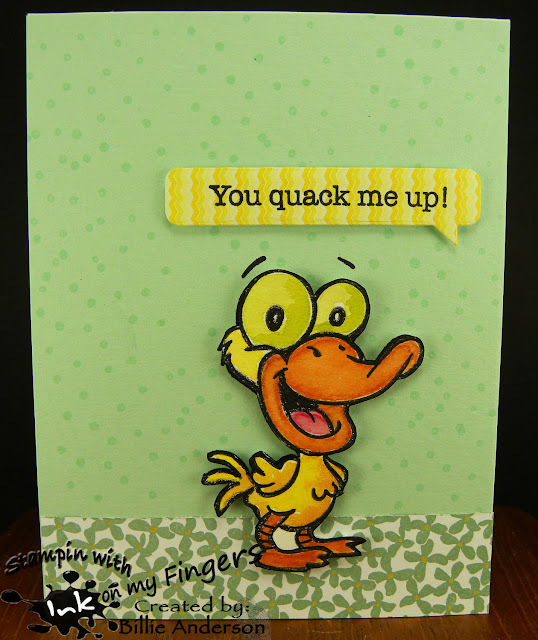 As soon as I saw this theme was duck I knew I would use this fun image from Your Next Stamp. I stamped the image on water color paper and painted with my Mission paints then fussy cut the image out. 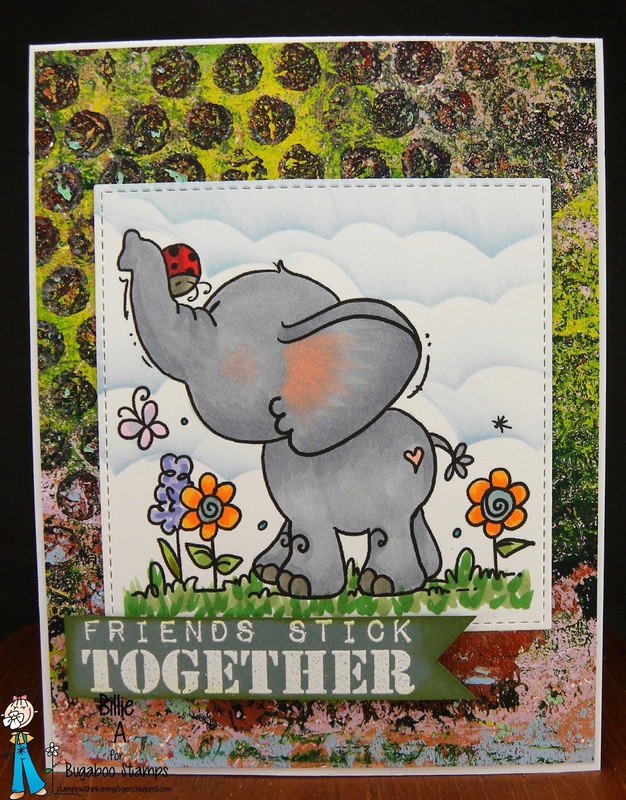 I then stamped with Versa Mark the Stampin up dots all over the background. I took a small strip of Stamping UP paper and adhered to the bottom and then added the cut duck. 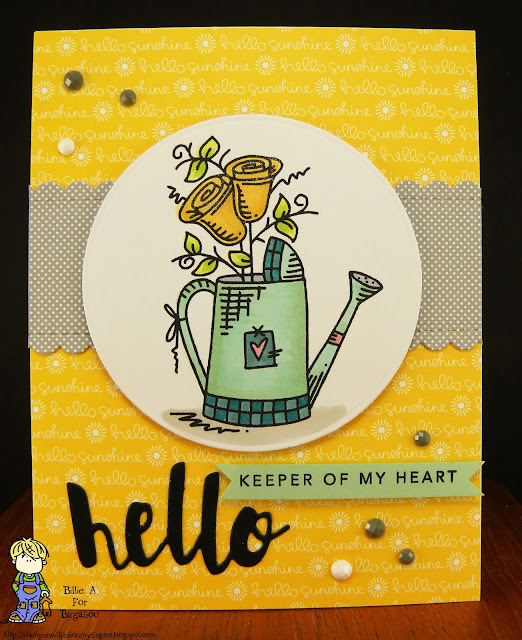 I stamped the sentiment on a piece of scrap paper and used the My Favorite Things speech die. I really kept this card CAS. Here is another stamp set I don't think I have ever used?? I truly don't remember if I have or not.. but I am now. I stamped the Stampin Up ornaments with Altnew inks and die cut them out and used the dies to cut out and added Stampin up gold cord and foam dots mounted them to the weathered wood looking designer paper. I stamped the Simon Says sentiment and added Nuvo drops to the ornaments. Bugaboo has an old new release.. again I think it's one that is now being added to the store from the old store. For my card I decided to pick the background paper first then that would determine the image colors. So this fun striped paper got picked so for Dottie's party dress I went with red. I gave her chocolate cup cake icing and of course chocolate cup cake or is it white.. hum .. what do you think? I colored her with copics. 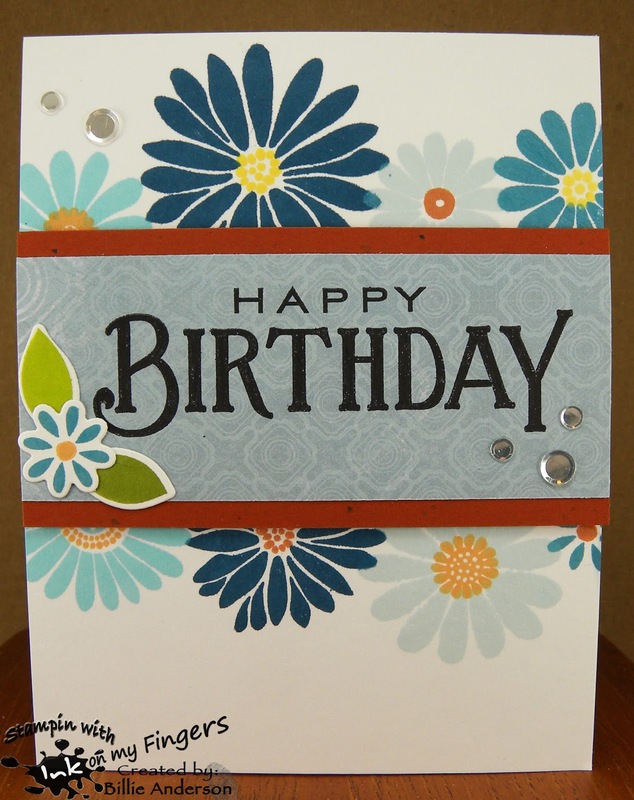 I then added some Stampin up and EK punched scallops / circles for the flower and used a gem brad from SU for the center. The leaves are SU dies. I added Spectrum Noir sparkle pen to her lips, earrings, dots on hat and candle flame. Playing again in my craft-room again I decided to paint a scene. This bird I had painted summer of 2017 and it was in a bowl I keep die cut images for future projects. Well this My favorite things bird looks like she needs to be on an island. So I used my Mission paints and created the island, water and clouds. I used a white gel pen to give white caps and sea foaming look. 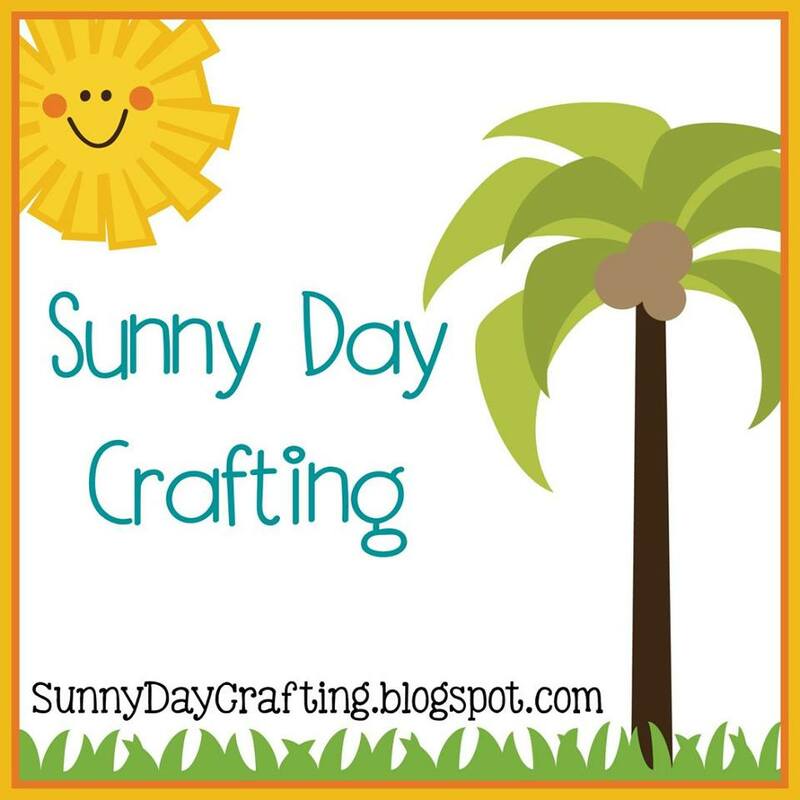 I used some scraps and Lawn Fawn tree and coconuts. I added some Ranger inks to give some shading. The bird was also colored with Mission paints. I think I need an island vacation.. My brother and SIL go to Hawaii each March for a month. oh I envy them for being able to do this. 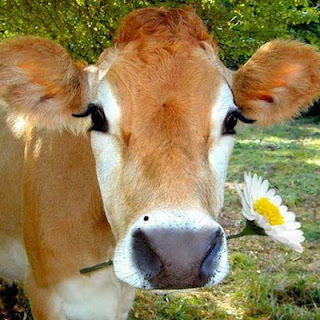 I love the photos he send me. We're back with another Free Friday from Bugaboo and you can see the fun projects that the design team created over at Catch the bug. This image is called Butterfly rose girlz I colored the image with copics and then cut the image out using Lil inker die. I found a scrap of designer paper and stamped the Stampin up sentiment. 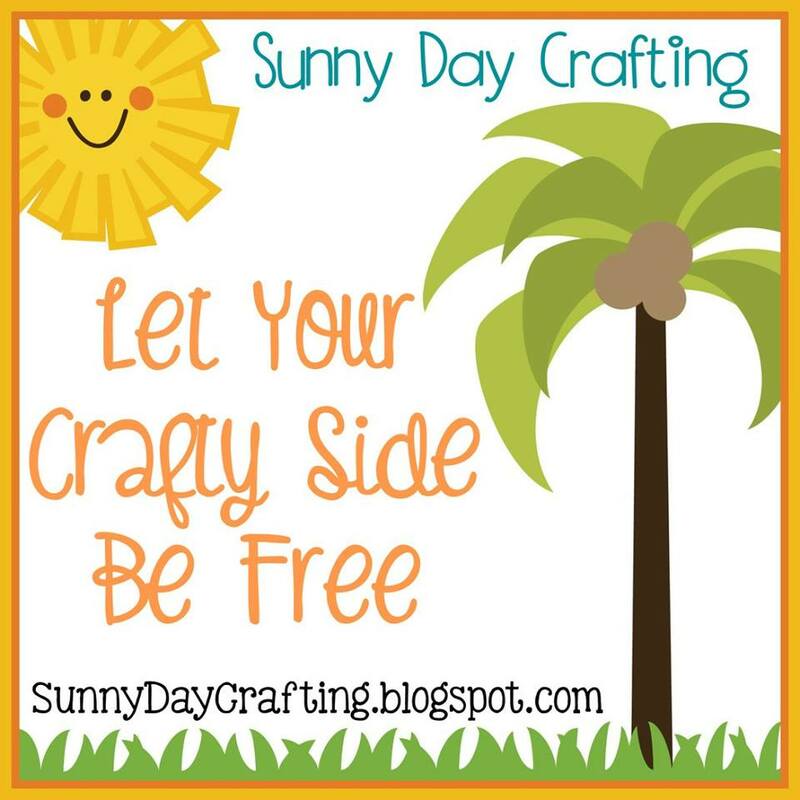 I used Simon Says scallop border die and then added this under the image. 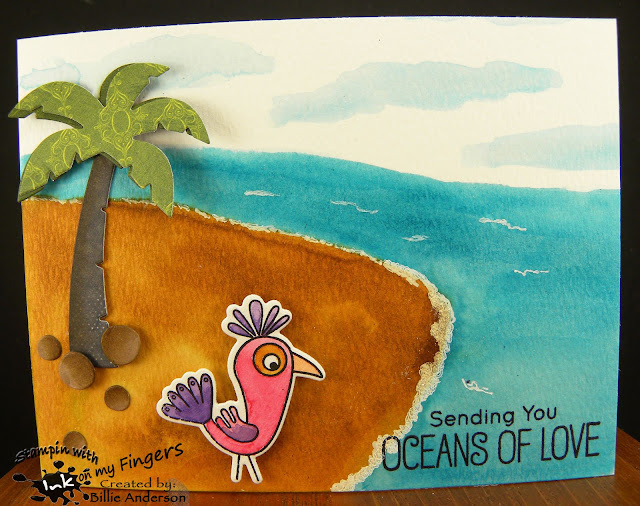 I added the image to the fun designer paper (I don't know who its by but I love it) and finished the card with some Nuvo drops. I did add some Spectrum Noir sparkle pen to the flowers, butterflies, her lips and hair bow. I was just playing in my craft room and I stamped this Simon Says flower and I also found on a shelf some liquid inks.. Susan Pickering Rethamel Pinata. I don't think I have ever used them and not even sure where I got them. I decided to give it a try. So I dropped a few drops in my little tray and just painted. I didn't care where color went or what I was just experimenting at this point. Since I didn't have any green in this set I took Lumiere green and used it for the leaves. I left the room and just let it be. Well couple days later I went back in and thought wow this kinda looks good. So I took a My favorite things die and cut it out. I then took some black cardstock and cut another. I then cut a section off as I didn't like it all one piece and across the card. I then thought the shimmer paper I was going to mount it to looked so plain so I watered down some black acrylic paint and splattered it all over. 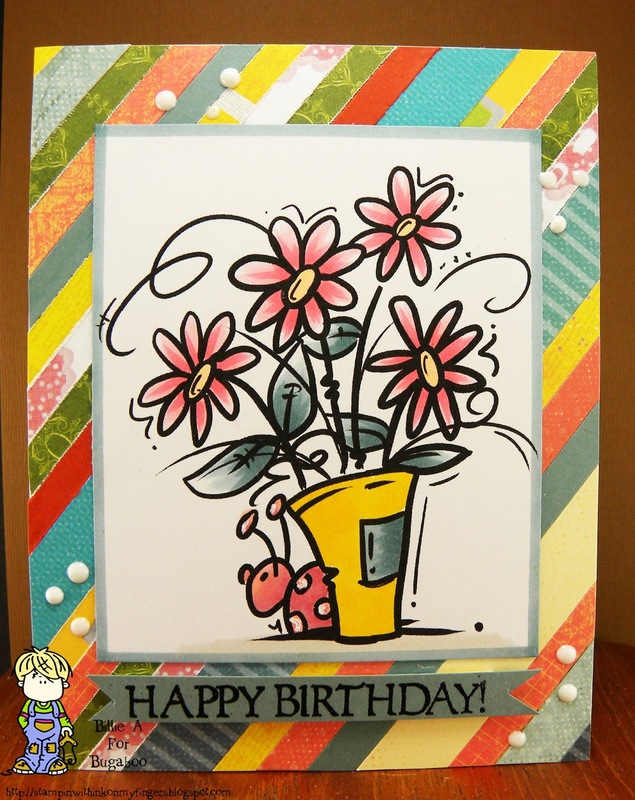 Once it was dry I added the flower part to the card. I thought hum I need a sentiment so I took the other piece and embossed the sentiment. I went over the flower with Spectrum Noir shimmer pen. I had fun just playing and seeing what could be done. 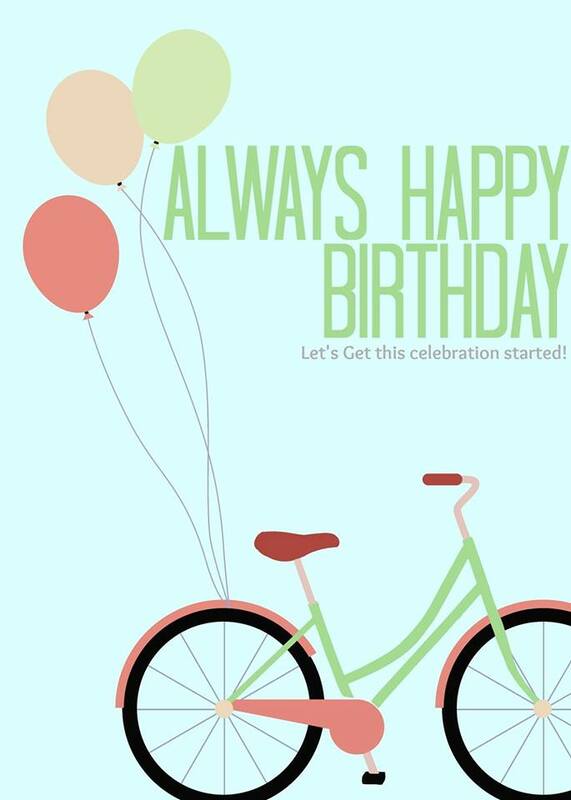 You can find this cute image in the Bugaboo store .. 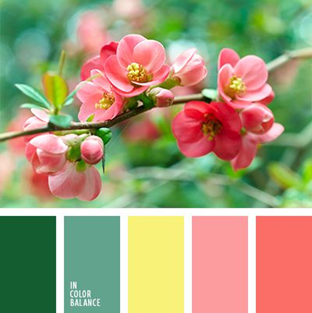 The image is called Spring elephant.. 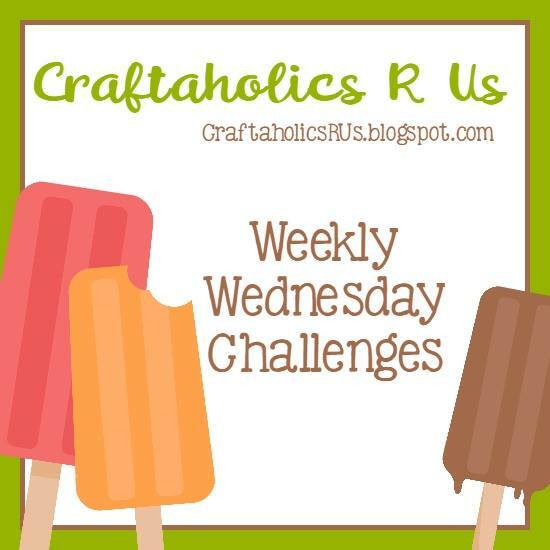 I started with a background I created years ago with my home made Gelli plate. I added this to the card base. Then I used copics and colored in the image and used My favorite things stitch die and my cloud template. I added this to the background. I then embossed the MFT sentiment and cut the piece into a banner. 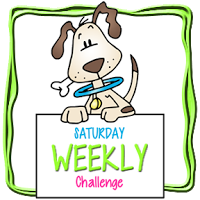 Head over to CTB and see what the DT created..
Last month I watched a video that Gina K did for Simon Says. 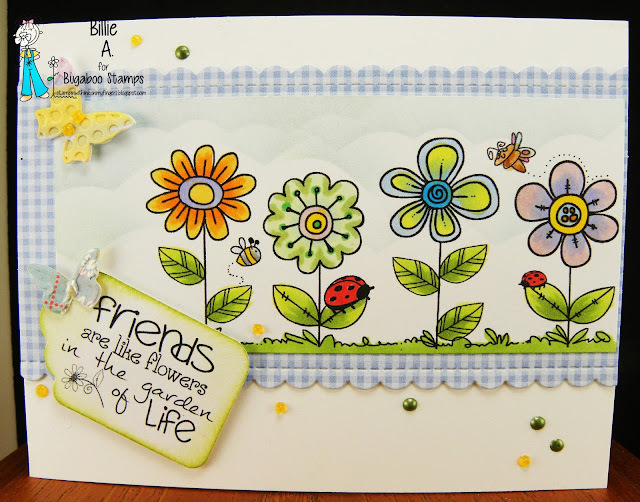 She embossed an image and then used Oxide inks and blended the background and added color to the flowers with the oxide as I did the blue and yellow flowers. When she was done she took a small brush dipped in water and went around the embossed part of the image which lifts the ink off of the embossing and some out of the flower. Then when it's dry you take a colored pencil I used Fabre Castell in a color that is close to the Ranger ink color... and add just a little pencil to the shading part then use Gamsol to spread the color out.. So that is what I did. I added the citron twist to the crocus but didn't like the look so I took a purple pencil and added color. Then I stamped and die cut the darling cute precious Pretty Pink Posh bees. I colored them with copics. I added Spectrum Noir sparkle pen to the wings. I added the bees and some gems. 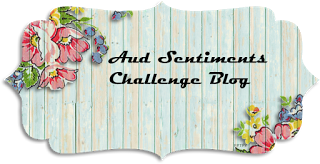 The flowers and sentiment is from Simon Says. 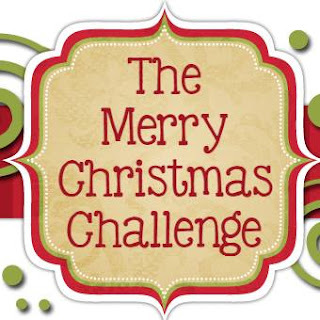 Howdy... we have a great new challenge at Pause Dream Enjoy #16.. the Orange team is here with a new theme.. The PHOTO below is your guide..
Will it be a cow and flowers or colors... hum. I cant wait to see what you create. This is my card. I started by using my cloud and ground templates that I have been using for years. I have a big box of x-ray film. I cleaned off the image by putting the film in a big tub with some bleach and water. This removes the photo on the x-ray.. I then cut the templates and like I said above I have been using them for years. The film holds up well. Anyway back to my card. I used Ranger ink for the background. I then stamped and colored the My Favorite Things images and die cut them out. As I was laying out my scene I was missing something in the background so I cut some trees out of scraps using Lawn Fawn tree die.. That worked out perfect. The trees are from Quick Quote scraps. I added the sentiment also from MFT. I have always loved this rubber stamp. It's a wood block stamp.. that is how old it is.. LOL.. It's by Carmen's Veranda stamps.. I colored her with copics and added some twine, doodlebug acrylic dots. The sentiment is from the Power Poppy acrylic stamp set. 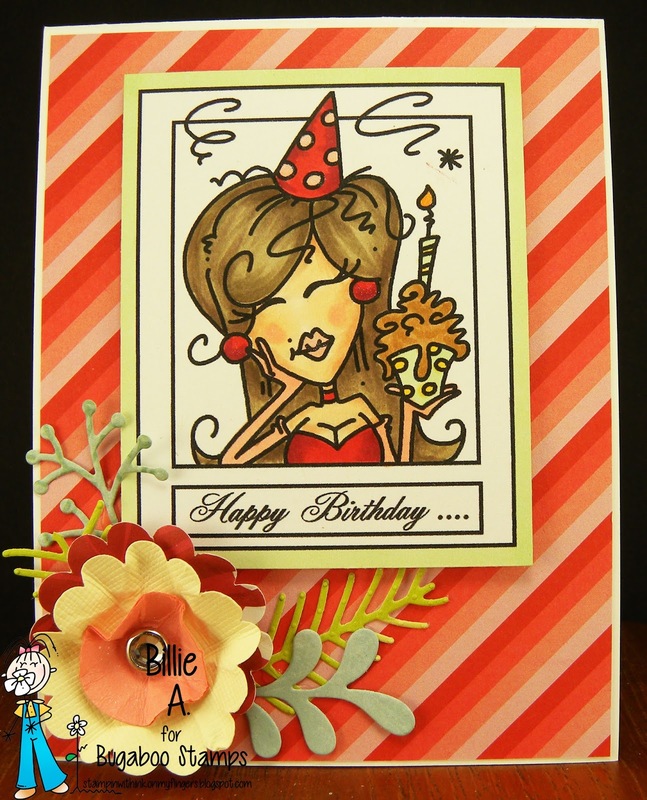 I love the richness of the colors and cant wait to see your fun cards. 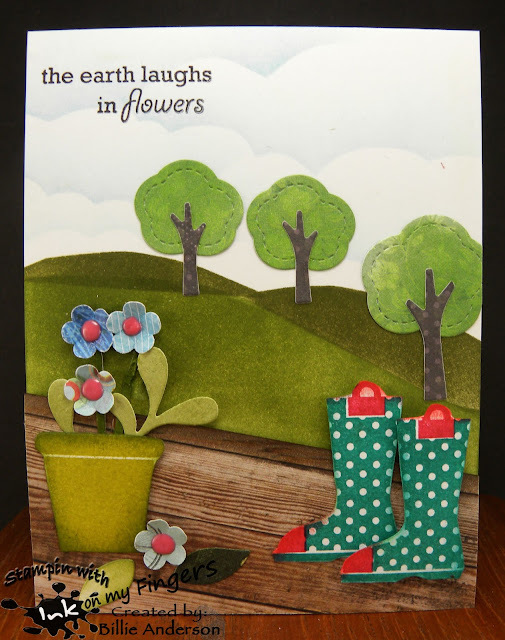 Fun digi set over at Bugaboo for their new release..
Called MS flower garden Check out the design teams creations over at Catch the bug. This new set comes with a group of different flowers. I colored the image with copics and used my cloud template for the sky. I added the sentiment that came with the set. I used Stampin up die and added some butterflies. The blue has a scalloped edge which is by Simon Says. I used some Nuvo drops. 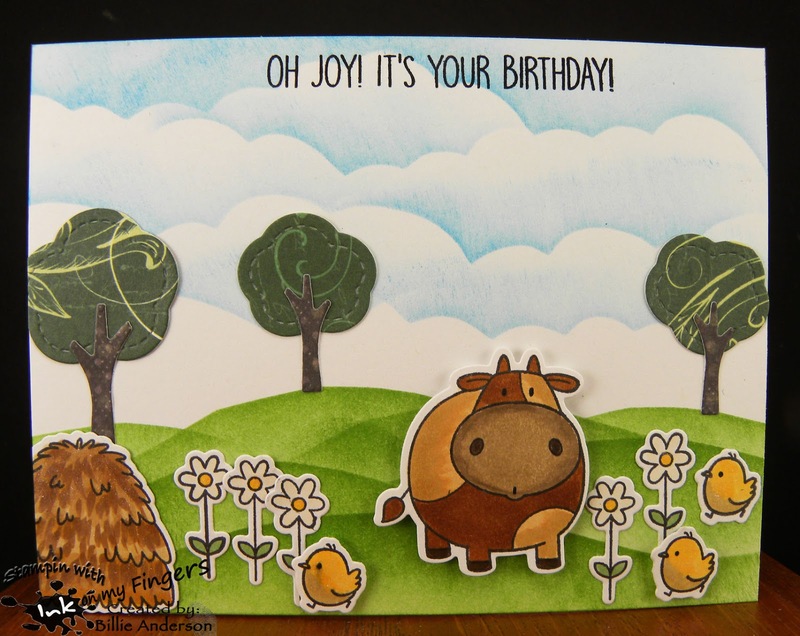 We're back with another challenge between Monika and Billie (that's me).. Monika from Creative with Monika chose the theme for April (her birth month).. and of course she chose SHOES.. card 1 is a scene with shoes and card 2 is a background with shoes and sentiment.. I had so much fun creating both cards but I think the scene one is my favorite. Card 1- I started by creating my green hills and sky clouds using my template I created. I then found this wood grain plank paper so I darkened up the thin board on the edge to give an ending to the deck. 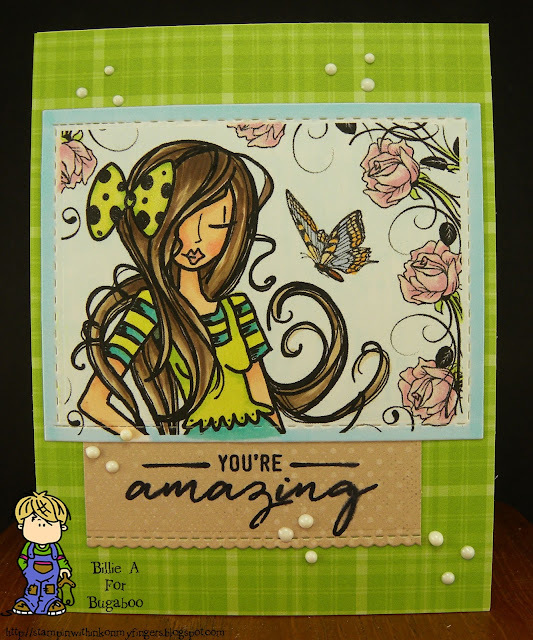 I then stamped the Paper Trey ink pot and boots using Stampin up inks. I fussy cut them out and mounted them on the deck. I dug through my leaves and flower box and came up with these leaves and flowers. I added a flower and leaves to the deck so it looks like they fell off. 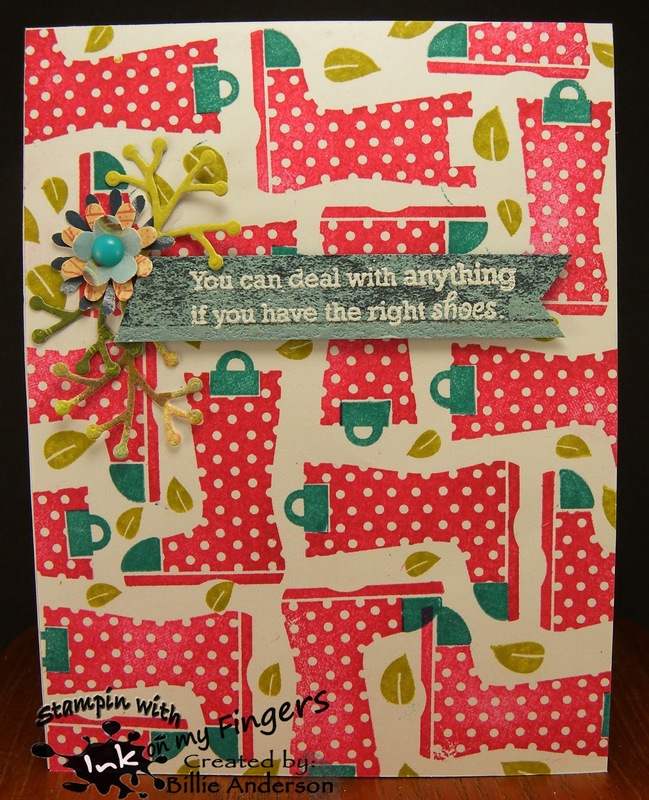 The background was a little bare so I took Lawn fawn tree dies and Quick Quote scraps and added them. I then added the PTI sentiment.. I added Nuvo drops to the flower centers and it was complete. This took a long time to make but so worth it..